After many years of patient waiting. The holy myrrh anoints body and soul. Of tables and icons and walls? As Easter mirthmotes (celebrations) for the Western churches (Catholic and Protestant) draw near, a certain sadness creeps in with them. Sadness in what has been lost in the West by its falling away from the wholeness of the Orthodox Faith in exchange for rationalist, philosophical constructs about God and/or emotionalist approaches to Him (which can never bring a man to true union with God). One of the greatest losses has been the Saints, those holy, living stones from whom God’s Grace, His Love, overflows and who are such strong supports in the edifice of the Church, whose work helps join us poor strugglers to the foundation of the Apostles and the Prophets and to the cornerstone of Christ Himself, that we might know the Father in Him through the Holy Ghost. Soþlice (Truly), if they are not present among a people claiming to be Christian, then the society they are building has no strong supports and is in danger of collapsing/falling apart. So it is in the South and Western Europe in this age: They are full of material wonders but bereft of divine-human ones, who can help us escape the Kingdom of Man (which is hell) and enter the Kingdom of God. Bearing this in mind, let us repent and take note of a few particularly important Saints for the South and Western Europe who reposed in February and March. Let us learn to love and honor them as wonderfully wrought men and maidens of the Father’s Kingdom, our beloved kinsmen, from whom the beauty of the All-Holy Trinity flows forth. Come, ye faithful, from the west and from the north, from the sea and from the east: let us make haste to the radiant feast, glorifying the wise enlightener of the Irish land and praising her struggles; and, clapping our hands, let us cry aloud: Glory to Thee, O Christ God, Who art wondrous in Thy saints! Having brought to thy homeland the light of Orthodoxy, which is that of the threefold Sun, and which heralded the day of salvation, O venerable one, by thy life didst thou instruct the people who, having been enlightened by faith, cried out: Glory to Thee, O Christ God, Who art wondrous in Thy saints! Forsaking princely rank and spurning earthly glory, thou didst choose slavery to Christ and voluntary poverty, desiring the angelic rank. Wherefore, having found thee to be a new and fervent intercessor, we cry out in thanksgiving: Glory to Thee, O Christ God, Who art wondrous in Thy saints! Rejecting thy noble rank, and loving the godly monastic life, from oaken wood didst thou build a convent, the first in thy land; and having there united a multitude of nuns to God, thou didst teach the surrounding lands to cry to the Lord: Have mercy on us! O all-glorious wonder! From childhood thou didst adorn thy life with virtue, and having been made a priest of Christ wast truly shown to be a luminary for His flock. Wherefore, having vanquished the demons by thy tireless spiritual warfare, in soul thou hast ascended on high, where thou beholdest thy Lord and Master face to face in the splendour of His glory. O all-glorious wonder that human flesh could be so mortified! For, following the ascetics of the desert thou didst lay waste thy body, resisting all the temptations of the flesh and putting away from thee all carnal thoughts, O David blessed of God; wherefore, arrayed in garments of purity as for a wedding feast, thou hast entered, rejoicing, into the joy of thy Lord. O all-glorious wonder, the grace of God which doth sanctify and deify filled thy humble soul, O David, and thou didst preach with eloquence against the accursed Pelagius, refuting his vile heresy, watchfully fending off from the faithful from its pernicious harm, and leading them in gladness into the splendid courts of Christ, to the mansions of the righteous. Come, O ye assembly of the faithful, and with reverent voices let us praise the holy bishop David, who as a good shepherd guided his flock to the Faith with the word of Truth, by his virtues teaching them to tread the straight and narrow path which leadeth to paradise. Truly, for his obedience the Almighty hath bestowed upon him manifold spiritual gifts, which he freely imparteth to those who bless his holy memory, entreating Christ to have pity on us and grant us remission of sins. Let the Christians of Wales join in gladsome chorus, uplifting their voices in joyous jubilation, as we celebrate the feast of the wondrous David, their holy father and enlightener, who now dwelleth with the saints on high, and doth ever earnestly intercede for us sinners. O thou who didst willing take up thy cross and follow Christ the Lord, and didst fill thy land with new communities dedicated to Him, send down from heaven the grace of God, O great and wondrous David, that we Christians may prevail over all heresies, having thee as an invincible ally amid our struggle for piety. His bursting from the spicéd tomb; His riding up the heavenly way; His coming at the day of doom: I bind unto myself today. confessors' faith, apostles' word, the patriarchs' prayers, the prophets' scrolls; all good deeds done unto the Lord, and purity of virgin souls. the flashing of the lightning free, the whirling wind's tempestuous shocks, the stable earth, the deep salt sea, around the old eternal rocks. of few or many, far or nigh, in every place, and in all hours against their fierce hostility, I bind to me these holy powers. against the wizard's evil craft, against the death-wound and the burning the choking wave and poisoned shaft, protect me, Christ, till thy returning. Christ beneath me, Christ above me, Christ in quiet, Christ in danger, Christ in hearts of all that love me, Christ in mouth of friend and stranger. I bind unto myself the Name, the strong Name of the Trinity, by invocation of the same, the Three in One, and One in Three. Of whom all nature hath creation, eternal Father, Spirit, Word: praise to the Lord of my salvation, salvation is of Christ the Lord. Loving chastity and meekness from thy youth, O Cuthbert, with steadfast intent thou didst acquire pure love for Christ, and thereby hast drawn nigh unto God. Wherefore, entreat Him now most earnestly, that He deliver from all afflictions those who celebrate thy yearly memorial. Assembling today, O ye Orthodox, with psalms and hymns let us praise the holy Cuthbert, crying out to him with reverence: O blessed and most glorious one, boast of hierarchs and monastics, beseech the Lord in our behalf, that He take pity and save our souls. O venerable hierarch Cuthbert, the multitudes of pilgrims who piously have recourse to thee in prayer are filled with joy and gladness; for the shrine of thy precious relics is shown to be a fount of healing for all the afflicted who approach with faith and love unfeigned. O successor of the godly apostles of Christ, steadfast pillar of the Orthodox Faith, teacher and defender of true piety, holy hierarch Cuthbert! Like a good shepherd thou didst watch over thy flock with vigilance, for which cause thou hast won great favor with Christ, the Chief Shepherd, and standest now with the sheep at His right hand in glory. Wherefore, intercede thou for all of us who honor thy holy memory as is meet. O Cuthbert, boast of monastics and true model for the servants of God, by thy struggles and pure manner of life thou hast come to shine forth like the brilliant sun upon the faithful; for Christ hath enriched thee with the gift of miracles. Wherefore, O venerable hierarch, we cry out to thee most fervently: In thy supplications be thou ever mindful of those who honor thy most splendid memory with faith and love! Source: Poems of Paul Hamilton Hayne: Electronic Edition, http://docsouth.unc.edu/southlit/hayne/hayne.html, 1999, accessed 22 March 2016, pgs. 147-8. © This work is the property of the University of North Carolina at Chapel Hill. It may be used freely by individuals for research, teaching and personal use as long as this statement of availability is included in the text. Turns to a wingèd splendor. Through the state’s cold machinery. 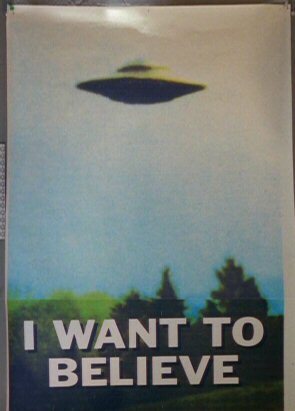 Anyone familiar with The X-Files will recognize the words of Mulder’s UFO poster, ‘I want to believe’. They represent his ardent desire to believe in beings from other worlds and other strange creatures and phenomena, even though he has little evidence to support his belief in them. The belief of the typical American in the blessings derived from his democratic/republican form of government is of the same type: He wants desperately to believe that they are so, in spite of all the evidence, past and present, to the contrary. Mr Brownson, as we were saying, early in The American Republic declares that a republican political system is a mark that a people have reached the highest levels of civilization (p. 23). And yet later in the same book, he says flatly, ‘The ballot of an isolated individual counts for nothing’ (p. 174), and this gives rise to political parties, which ‘have no conscience, no responsibility, and their very reason of being is, the usurpation and concentration of power’ (p. 175). He suggests that the remedy is the division of powers among the various levels of government - local, state, and national (pgs. 175-6) - but even at the town level, the ballot of one man still ‘counts for nothing’, the need to form parties thus still exists, and the same tendency to concentration of power (and abuse of power) will continue. All this notwithstanding, Mr Brownson (and many Americans), blinded by their political ideology, still go on boasting that ‘the American constitution . . . is the least imperfect that has ever existed’ (p. 176) or that it is the one in history most in accord with Christianity (p. 268). But this is not all. Democracies/Republics also tend to lower the ideal image of man to the mediocre. For this is perhaps the largest class of people in most societies, and in a land where universal adult suffrage exists, it becomes the most important class. Therefore, the gaze of most in such a society rests primarily on them, and they model their lives after them. Norman Muller had a small blond mustache that had given him a debonair quality in the young Sarah’s eyes, but which, with gradual graying, had declined merely to lack of distinction. His forehead bore deepening lines born of uncertainty and, in general, he had never seduced his clerkly soul with the thought that he was either born great or would under any circumstances achieve greatness. He had a wife, a job and a little girl, and except under extraordinary conditions of elation or depression was inclined to consider that to be an adequate bargain struck with life (The Complete Stories: Vol. 1, New York: Doubleday, 1990, p. 44). There is a flip side to this coin, however. It is that mankind will never completely give up its search for and veneration of extraordinary men and women, whether saints, virtuous gentlemen and ladies, etc. But where these are missing, a danger arises. C. S. Lewis said of this ingoading and this danger, ‘Monarchy can easily be debunked, but watch the faces, mark well the debunkers. These are the men whose taproot in Eden has been cut: whom no rumour of the polyphony, the dance, can reach - men to whom pebbles laid in a row are more beautiful than an arch. Yet even if they desire mere equality they cannot reach it. Where men are forbidden to honour a king they honour millionaires, athletes or film stars instead: even famous prostitutes or gangsters. For spiritual nature, like bodily nature, will be served; deny it food and it will gobble poison’ (http://www.monarchy.net/Quotations.aspx, accessed 5 March 2016). Such is progress in America. The South in her better days has recognized these things. On the shortcomings of elected governments, the Maryland Anti-Federalist writer, styling himself ‘A Farmer’, writing in March 1788 during the ratification debates, said of them, ‘Throughout the world government by representation, seems only to have been established to disgrace itself and be abolished — its very principle is change, and it sets all system at defiance — it perishes by speedy corruption. — The few representatives can always corrupt themselves by legislative speculations, from the pockets of their numerous constituents — quick rotation, like a succession of terms tenants on a farm, only encreases the evil by rendering them more rapacious. If the executive is changeable, he can never oppose large decided majorities of influential individuals — or enforce on those powerful men, who may render his next election [null? impossible? The word is missing from the surviving text.--W.G.] . . .’ (A Farmer, Essay V, http://www.constitution.org/afp/md_farmer.htm, accessed 10 March 2016). Patrick Henry added elsewhere, during the Virginia ratification debates, ‘The honorable gentleman who presides told us that, to prevent abuses in our government, we will assemble in Convention, recall our delegated powers, and punish our servants for abusing the trust reposed in them. O sir, we should have fine times, indeed, if, to punish tyrants, it were only sufficient to assemble the people! . . . Did you ever read of any revolution in a nation, brought about by the punishment of those in power, inflicted by those who had no power at all’ (http://www.constitution.org/rc/rat_va_04.htm, accessed 10 March 2016)? If the ballot is powerless against evil, if left to itself it in fact causes evils to spring forth, what is to be done? We must think of how to welcome Christian, hereditary æþeldom (aristocracy) and kingship into our political order again. Quoting once more from A Farmer: ‘After every consideration I can give this subject, I am satisfied, that government founded on representation, indispensibly requires, at least an executive for life, whose person must be sacred from impeachment, and only his ostensible ministers responsible — A senate for life, the vacancies to be filled up and the number occasionally encreased but under a limitation, by the executive — the hand that holds the balance must have the power of adding weight and influence to the lightest scale, and of frequently removing turbulent men into an higher and inoffensive situation . . .’ (A Farmer, Essay V, http://www.constitution.org/afp/md_farmer.htm, accessed 10 March 2016). A priest who is not a monarchist is not worthy to stand at the altar table. The priest who is a republican is always a man of poor faith. God himself anoints the monarch to be head of the kingdom, while the president is elected by the pride of the people. The king stays in power by implementing God’s commandments, while the president does so by pleasing those who rule. The king brings his faithful subjects to God, while the president takes them away from God. The most obvious proof of this is the fact that God the Word has become Incarnate, has become man (St. John 1:14). By His Incarnation, matter has been magnified with Divine glory and has entered into the grace- and virtue-bestowing, ascetic aim of deification, or union with Christ. God has become flesh, has become human, so that the entire man, the entire body, might be filled with God and with His miracle-working forces and powers. In the God-Man, the Lord Christ, and His Body, all matter has been set on a path toward Christ —the path of deification, transfiguration, sanctification, resurrection, and ascent to an eternal glory surpassing that of the Cherubim. And all of this takes place and will continue to take place through the Divine and human Body of the Church, which is truly the God-Man Christ in the total fullness of His Divine and Human Person, the fullness "that fills all in all" (Ephesians 1:23). Through its Divine and human existence in the Church, the human body, as matter, as substance, is sanctified by the Holy Spirit and in this way participates in the life of the Trinity. Matter thus attains its transcendent, divine meaning and goal, its eternal blessedness and its immortal joy in the God-Man. The holiness of the Saints—both the holiness of their souls and of their bodies—derives from their zealous grace- and virtue-bestowing lives in the Body of the Church of Christ, of the God-Man. In this sense, holiness completely envelopes the human person—the entire soul and body and all that enters into the mystical composition of the human body. The holiness of the Saints does not hold forth only in their souls, but it necessarily extends to their bodies; so it is that both the body and the soul of a saint are sanctified. Thus we, in piously venerating the Saints, also venerate the entire person, in this manner not separating the holy soul from the holy body. Our pious veneration of the Saints' relics is a natural part of our pious respect for and prayerful entreaty to the Saints. All of this constitutes one indivisible ascetic act, just as the soul and body constitute the single, indivisible person of the Saint. Clearly, during his life on the earth, the Saint, by a continuous and singular grace- and virtue-bestowing synergy of soul and body, attains to the sanctification of his person, filling both the soul and body with the grace of the Holy Spirit and so transforming them into vessels of the holy mysteries and holy virtues. It is completely natural, again, to show pious reverence both to the former and to the latter, both to soul and body, both of them holy vessels of God's grace. When the charismatic power of Christ issues forth, it makes Grace-filled all the constituent parts of the human person and the person in his entirety. By unceasing enactment of the ascetic efforts set forth in the Gospels, Saints gradually fill themselves with the Holy Spirit, so that their sacred bodies, according to the word of the holy Apostle, become temples of the Holy Spirit (I Corinthians 6:19; 3:17), Christ dwelling by faith in their hearts (Ephesians 3:17) and by fruitful love also fulfilling the commandments of God the Father. Establishing themselves in the Holy Spirit through grace-bestowing ascetic labors, the Saints participate in the life of the Trinity, becoming sons of the Holy Trinity, temples of the Living God (II Corinthians 6:16); their whole lives thus flow from the Father, through the Son, in the Holy Spirit. By piously venerating the holy relics of the Saints, the Church reveres them as temples of the Holy Spirit, temples of the Living God, in which God dwells by Grace even after the earthly death of the Saints. And by His most wise and good Will, God creates miracles in and through these relics. Moreover, the miracles which derive from the holy relics witness also to the fact that their pious veneration by the people is pleasing to God. ‘Precious in the sight of the LORD is the death of his saints’ - Ps. 116:15 KJV. ‘ . . . behold, now is the accepted time; behold, now is the day of salvation’ - II Cor. 6:2 KJV. Now does the South begin to be fully herself. Now are the firstfruits of Southern holiness offered to God. Now is the fulness of the life in Christ found in the Holy Orthodox Church made manifest in the Southland. 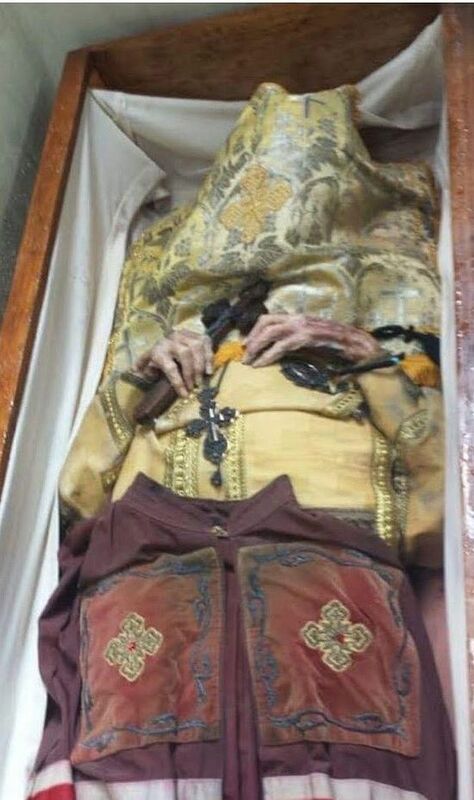 For a true son of the Souð, born Robert Royster in Teague, Texas, and falling asleep in the Lord as the Most Reverend Dmitri, Archbishop of Dallas and the Diocese of the South, has been found to have incorrupt relics by the holiness of the life he lived.
. . . In the early morning of March 4, when Restland employees opened the concrete vault that contained Vladika’s wooden coffin, I was ready to see all these horrible things I was told about. To our amazement, Vladika’s coffin was found intact amidst the wet atmosphere of the sealed vault and was easily opened. The Funeral Director, who was present there in a complete haz-mat mask, stated that she had never seen a non-embalmed body in such a condition after 5 years in the grave, and that she believes it is a miracle. Thanks be to God, the South has now fully re-established her bond with the Faith of her Orthodox forebears of Western Europe and Africa by bearing a saint. For this is what the Church does in all ages: She makes saints. Salvation is not merely a legal declaration that we are righteous in God’s sight and that we will escape hellfire, while we remain the slave of our fallen passions to the grave. Ræther, it is to be truly filled with God’s holiness, His outflowing energies, His own Life, that we might become new creations by assimilating that Grace into our souls and bodies. This is what St Dmitri did, and what we are called to do, by living the life of the Lord Jesus Christ in this world. The South still has a long way to go before a true Southern Orthodox culture arises in the same manner as the Orthodox cultures of Rome, Africa, England, etc. before the dark times of heresy and schism set in, but she has a taken a step forward nevertheless, a very big step forward.